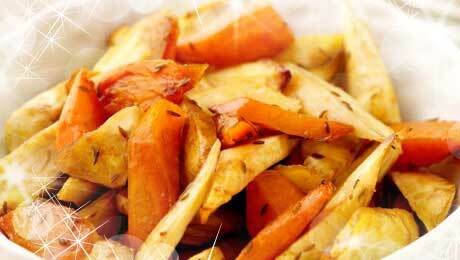 These roasted vegetables will go fantastically with any festive meal. The honey drizzled over the vegetables gives them a really sweet taste. In a large bowl mix together the carrots and parsnips, drizzle with the olive oil and season generously with salt and pepper. Arrange on a foil lined tray and place in the oven for 20 minutes. Remove from the oven and toss before returning to the oven for a further 10–15 minutes until tender. A few minutes before serving, melt the butter in a saucepan, whisk in the honey and balsamic vinegar and drizzle over the vegetables. Sprinkle with cumin seeds for additional flavour if desired.